trfnews: The Small Business, Enterprise and Employment Act 2015 will compel UK banks to refer SMEs rejected for funding to selected alternative finance providers, such as online invoice trading platforms. How do you think this will impact on the alternative finance market? Adam Tavener: The purpose of the compulsory referral section of the Act is absolutely to provide stimulus to the alternative funding market. This is not the endgame, it’s the beginning of a change in mindset, where mainstream funders will begin to take a much more collaborative approach to lending solutions, but nonetheless we’re hoping for a significant impact. trfnews: Does this Act mean we can expect more regulation, and will this be a good thing? Adam Tavener: Will we see more regulation in the future? There isn’t a huge amount relating to regulation in the Act beyond the role of regulators in overseeing platforms designated to receive bank referrals. It’s reasonable to assume, however, that business funding to SMEs will become increasingly regulated as time goes on. trfnews: The banks currently seem to be withdrawing from the receivables finance area. If they decide to refocus on it at a later date, will there be a conflict of interest? Adam Tavener: I don’t see how really, with the way the dynamics of the Act work, a bank has the right and the absolute commercial imperative to try and deliver its own product first, and only when it’s unable or unwilling to deliver on suitable terms, is it then required to pass it over to the alternative sector. Whether that’s a receivables deal, or any other kind of deal, it doesn’t imply any room for a conflict of interest. What it does do is imply a greater need for collaboration, where a bank wishing to retain the goodwill and custom of the SME may elect to do parts of the deal and then use an alternative funder to provide a supplementary finance to complete the offering. In general, I do anticipate a greater level of collaboration between banks and platforms, and banks using the platforms to meet funders. I don’t really have any concern about a conflict of interest. trfnews: With these referral obligations, is there a reputational risk for the banks? How can they ensure the platforms don’t fail referred clients? How will they behave in their role as quasi-brokers? Adam Tavener: The proposal I put to Downing Street initially relates to the fact that, in the current environment, there is a reputational risk if a bank refers outside itself. But if you bring in legislation, have the platforms designated by the government and controlled by a regulator, then the bank doesn’t have a reputational or regulatory risk at all, because it is merely complying with its obligations in law. As soon as that referral is made under the terms of the Act, the bank is exposed to no further risk– the bank can’t choose which platform it cooperates with, it will have to work with all designated platforms, and it’s not in the bank’s remit to act in a procurement role, it simply has to pass across the appropriate information to the platform, as described within the Act. It is the responsibility of the platform designating authority, run by the British Business Bank and the Treasury, to ensure that the platforms are delivering what they say they’re going to deliver. How will they act as quasi-brokers? I think the banks at a relationship management level will go beyond the definitions of their obligations within the Act. A good relationship manager will sit with a customer and say: the bank has an appetite to meet one part of your funding requirements but not the rest, so there’s no point moving forward. Instead, let’s go to one of the platforms and enter the relevant info, and that platform will allow us to select a number of partner funders, so we can actually move forward with the whole funding deal. I think relationship managers are ideally placed to do this and it’s an opportunity for the banks to undo some of relationship damage they’ve incurred with SME customers over the past five to 10 years, through adopting the role of helpful and honest brokers and advisers, rather than just operating in a binary yes/no format with customers. trfnews: How will the alternative finance market change as it continues to become more mainstream? Can we expect consolidation? How will it affect clients? Adam Tavener: Well, clearly the alternative finance market is growing, and there is a significant desire at ministerial level to ensure that in future we don’t end up in a situation where business funding is being provided by one of four big banks – that’s just unhealthy. However, and this is a big however, can we expect consolidation? For me, certainly, yes. Even though the Act mandates that banks have to refer across rejected applicants, the explosion in the number of alternative funders on the market means a lot them aren’t going to make it. At the moment the vast majority of them still aren’t making a profit, and for a lot of them the cost of securing new business is actually greater than the lifetime value of the deal that they’re acquiring, and this is before we even get to paying overheads. This isn’t going to be put right overnight by the Act, so I think we will see some consolidation in the sector, either because some of the alternative models aren’t sufficiently commercial, or because the providers themselves don’t have deep enough pockets and/or enough backing to get through what will be a war of attrition over the next few years. Any marketplace that grows this rapidly will have to see some shrinkage before it matures. Alternative funders need to get their message out there and raise their profile with small business owners looking to invest in their companies. That was the rallying call from Clifton Asset Management’s Adam Tavener after a new survey revealed nearly 70 per cent of small businesses said they would use alternative funders to raise capital. The research revealed that figure rises to 94 per cent for SMEs with annual revenue over £1.1 million, according to the study by UK Bond Network. 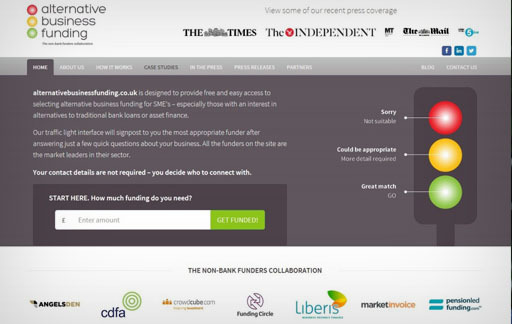 Adam, behind the launch of the alternativebusinessfunding.co.uk (ABF) portal, said that while the alternative funding sector was “growing rapidly” it was dwarfed by the amount lent by banks to SME owners. But that could be about to change. One key element of the new Small Business, Enterprise and Employment Act requires banks to refer those firms rejected for loans to online platforms which can introduce them to alternative funding providers. Many find the traditional funding route blocked after being turned away by the banks, with first-time SME borrowers facing a 50 per cent rejection rate. Soon SME owners could be looking to alternative funders first instead of automatically turning to the High Street banks. Half of SMEs recognise alternative finance as creating new opportunities for funding, according to the UK Bond Network poll of 250 mid-market businesses. But 42 per cent of businesses below the £1.1 million turnover threshold were unaware of the alternative options available to them, it revealed. Adam said: “The UK Bond Network survey into alternative funders highlights a number of current issues. “Yes, the sector is growing rapidly but actually remains very small in comparison to the volume of lending to SME’s provided by the High street banks. “We would definitely agree that there needs to be a greater level of awareness in the advisory sector, with many accountants and other business advisors having a poor knowledge of such specialist areas as crowd funding or pension-led funding, for example.